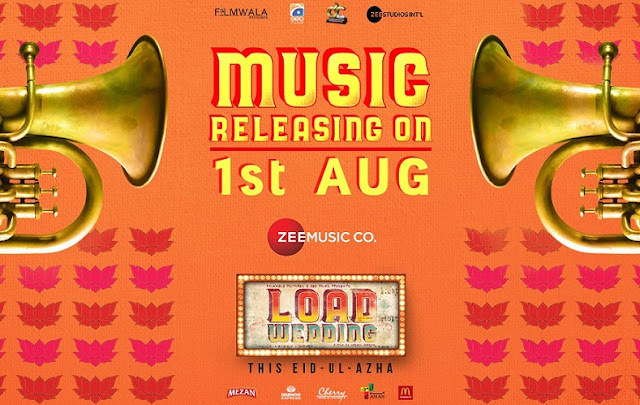 Karachi : Filmwala Pictures’ and Geo Films upcoming film Load Wedding - a social comedy film/ family drama has been creating positive word of mouth due to its upbeat tune and dynamic vibes. Movie’s music is slated to release on August 1, 2018 by Zee Music Co. The film stars one of the much-admired on-screen couple of the Pakistani film industry - Fahad Mustafa and Mehwish Hayat in the lead roles and is directed by Nabeel Qureshi. Music is an integral part of any movie and Filmwala Pictures give refined polished compositions that never disappoint audience. The buoyant bhangra tune has been the lucrative factor of the teaser initially released. The album consists of 5 songs, music director of the film is Shani Arshad, who has worked on all previous films of Filmwala Pictures. It can be anticipated that the music release is going to take social media by storm. Load Wedding will be hitting the cinemas in Pakistan and worldwide on Eid ul Azha.